FREE DOMESTIC SHIPPING WITH $50 PURCHASE! This rich facial cream is a rejuvenating powerhouse of moisture and antioxidants. The natural blend of organic whipped oils will literally melt into your skin, helping to restore and protect your skin’s natural beauty. 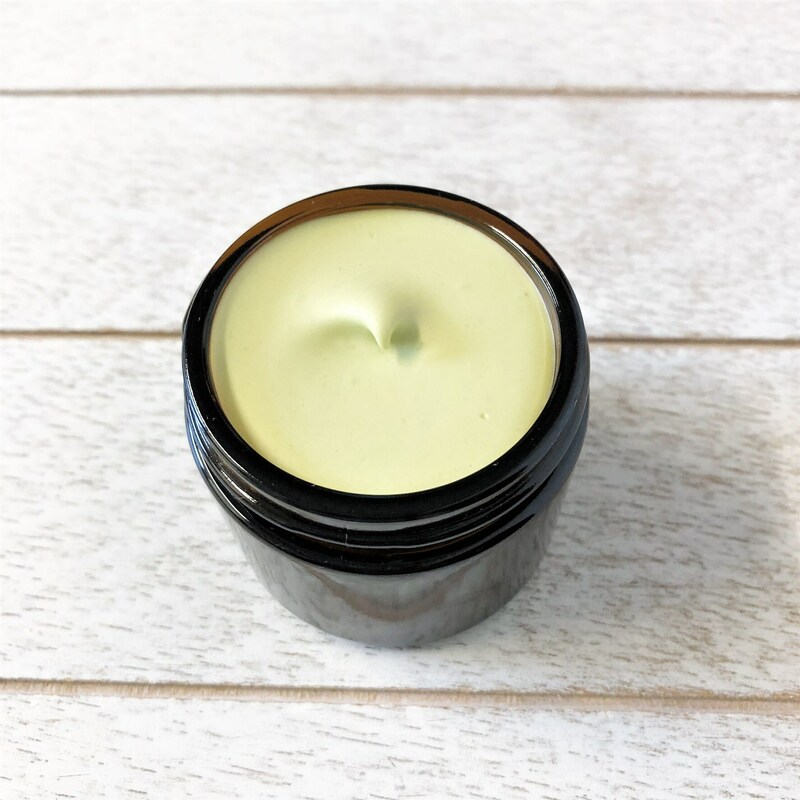 This is a very concentrated anti-aging cream, suitable for all skin types; only a small amount is needed to rapidly penetrate skin and achieve the many benefits this natural moisturizer has to offer, so this jar will last you a long time. The highly effective, natural and organic plant-based oils contain age-defying antioxidants and emollients to counteract free radical damage caused by the sun and environment, while working to hydrate, smooth, and nourish your skin. A little goes a long way! Scoop out small pea-sized amount with a clean spatula or fingernail and apply to face morning and evening, after cleaning and toning. Follow with SPF if going into sun. For added benefit, you can spritz on your favorite floral water or hydrosol before applying. Because this product is all natural, without preservatives, care should be taken to avoid moisture, direct light, and heat. It will last longer stored in a relatively cool, dark location. Shelf life for properly stored facial cream should be approximately 1 year from date of purchase. This cream is able to be preservative-free because there are no ingredients that contain water. Introducing water will lead to greater chances of spoilage, so please take care to avoid allowing water to enter the jar. Always perform a patch test when using any new product on your skin for the first time. Discontinue use if any irritation occurs. Warm Months Policy: Expedited shipping recommended during warm months. This product will melt at high temperatures and become semi-solid again when cooled. This will not affect the quality of the product, but original consistency may be affected. If the product melts, gently, shake or stir and then place jar in the refrigerator for about 30 minutes, the whipped consistency may change but you will still achieve the same moisturizing results. Always store jar in a cool dry place. I cannot issue refunds for melted products, therefore please ensure to track shipment to refrain from package sitting in a hot mailbox. To fulfill your order, you must provide me with certain information (which you authorized Etsy to provide to me), such as your name, email address, postal address, payment information, and the details of the product that you’re ordering. You may also choose to provide me with additional personal information (for a custom order of body oil, for example), if you contact me directly. All products are created with natural and organic ingredients, including nut oils and butters. Please be sure to take a look at ingredients to make sure you are not purchasing something you have had a reaction to in the past. Especially if you have sensitive skin, you may want to do a patch test on the inside of your arm to make sure your skin is comfortable with the ingredients. Because all products are created with natural ingredients, care should be taken to avoid moisture, direct light, and heat. They will last longer stored in a relatively cool, dark location. Shelf life for most, properly stored items should be approximately 1 year to 18 months. Due to the nature of the products, returns and exchanges are not accepted unless the item is unopened and in it's original packaging and condition. I want you to be happy with your order! If you are unsatisfied for any reason, please contact me to give me the opportunity to make it right. Customer satisfaction is my highest priority! Custom and personalized orders are welcome. I am happy to help you come up with something that fits your needs. Please contact me to work out the details. 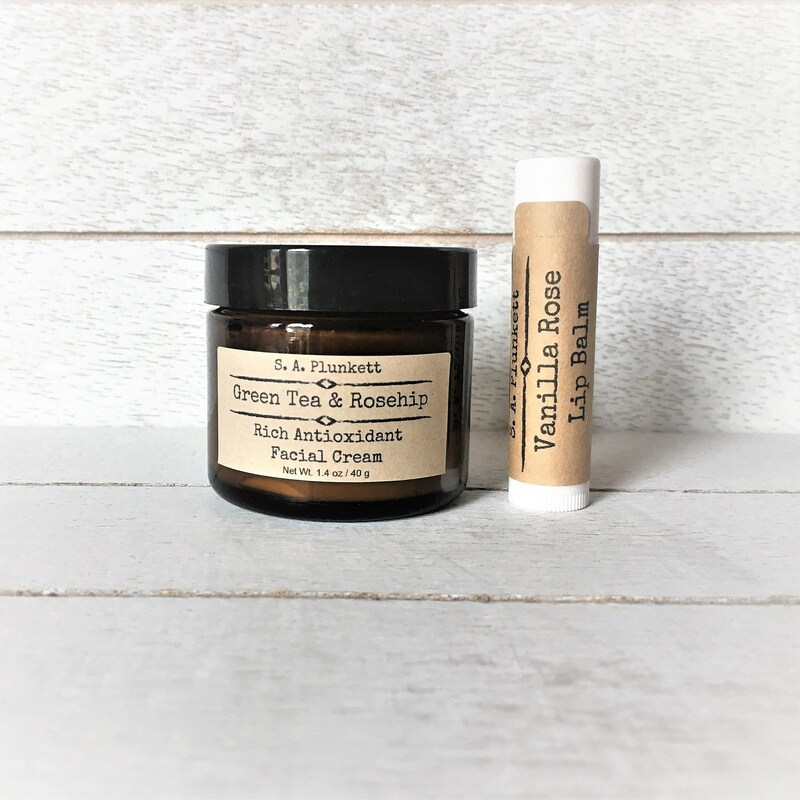 All natural body butters, facial creams and balms may liquefy or melt in hot weather. This will not affect the quality of the ingredients, though texture may be different after the product solidifies again. 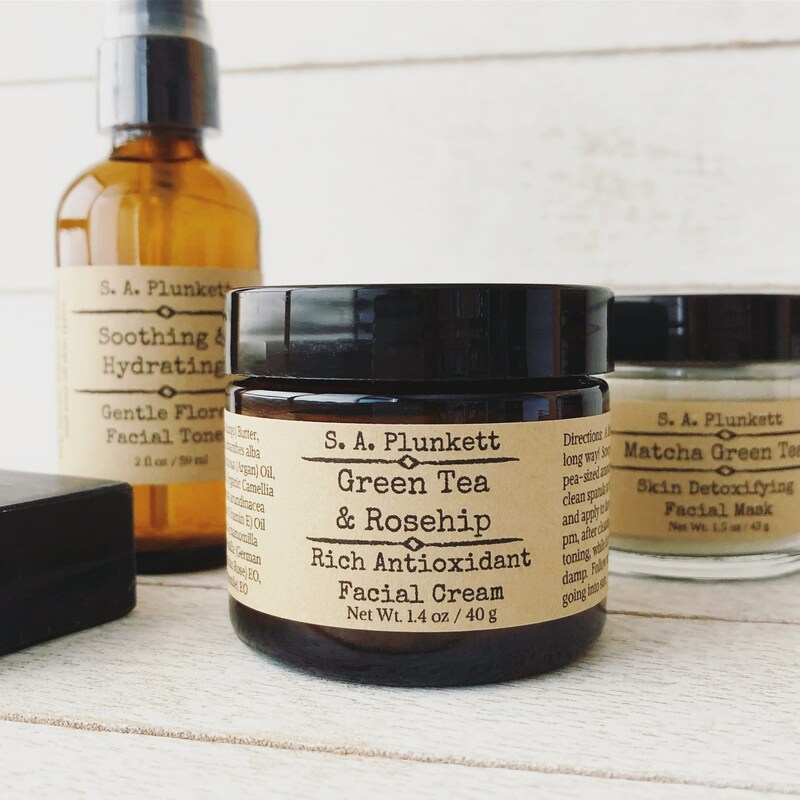 S. A. Plunkett Naturals LLC is not responsible for products that melt or liquefy during shipping or due to pore storage practices. If you receive a product that has liquefied, just place in a refrigerator for an hour or two and it should return back to the intended solid or semi, solid state. Please feel free to contact me with any questions. I love this product for right before bed. I have dry / acne prone skin so finding a moisturizer that won’t break me out is difficult. I highly recommend! First, a bit about me: I have terrible skin (breakouts, scars from breakouts, dryness, oil, the works). Second, probably due to the bad skin, I'm a VIB Rouge at Sephora, which means basically all my $$$ goes to them. UNTIL! 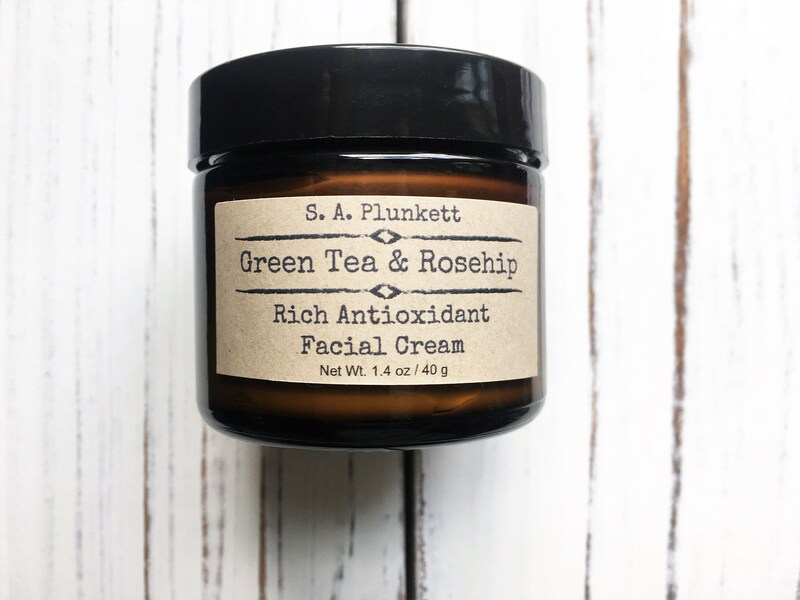 I found these products, especially the green tea facial cream in Portland and re-ordered almost instantly. This stuff is amazing! Incredible moisturizer which holds up well all day even in winter temperatures, and my skin is glowing! Sally is also a very nice salesperson, happy to explain things and always includes samples, which are packaged in a way that makes them perfect for frequent travelers. Total convert to these products; now all I need is for her to come up with a bronzer and I might never need to go to Sephora again ;) Thank you Sally!! I am wowed by these products. If you follow the directions to a T, the moisturizer is light weight and not oily like most home made products are. The free samples are wonderful, I especially love the lavender charcoal soap and the oatmeal cleanser. I spritz on rosewater and apply the moisturizer with the mini spatula then rub it in with clean hands. Will definitely order again as needed.